Pirates, SEALS and a turf war? 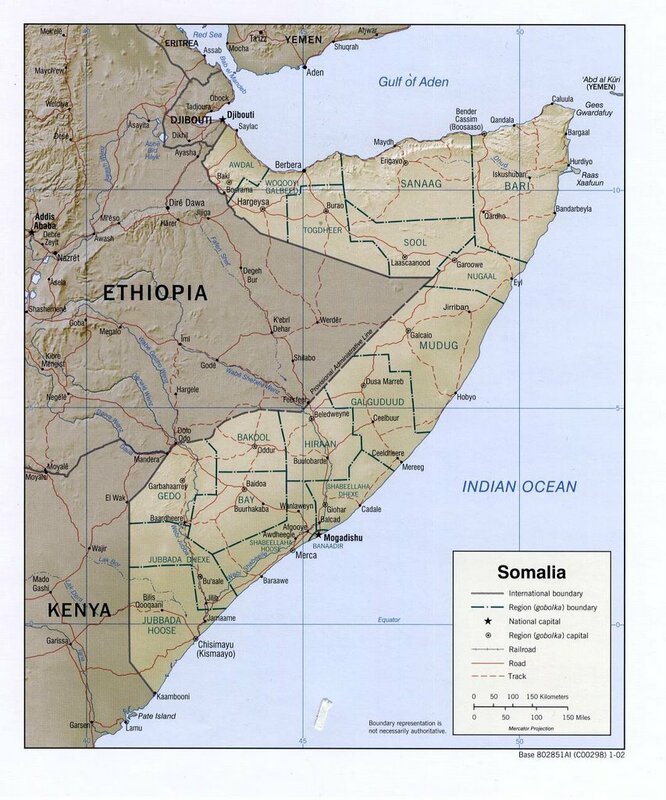 The new focus on pirates fills a vacuum in and around the Somali coast, according to U.S. spokesmen and analysts. A number of high profile incidents have involved pirate attacks in Indian Ocean waters in the area. Monday I wrote about how U.S. Central Command (CENTCOM), which controls the activities of the special operations headquarters, seems to be ignoring the epicenter of greatest danger: the "ungoverned spaces" of western Pakistan. Is the new special operations maritime focus on the lawless water off Somalia just what the doctor ordered? Or is the counter-piracy campaign an opportunistic power grab by Navy SEALs to find something to do in the water? Dr. J. Peter Pham of James Madison University has written about the growing phenomenon of piracy in the Indian Ocean and Somalia. Last November, it will be remembered, pirates fired a rocket propelled grenade into the cruise ship Seabourn Spirit while operating off the Somali coast. 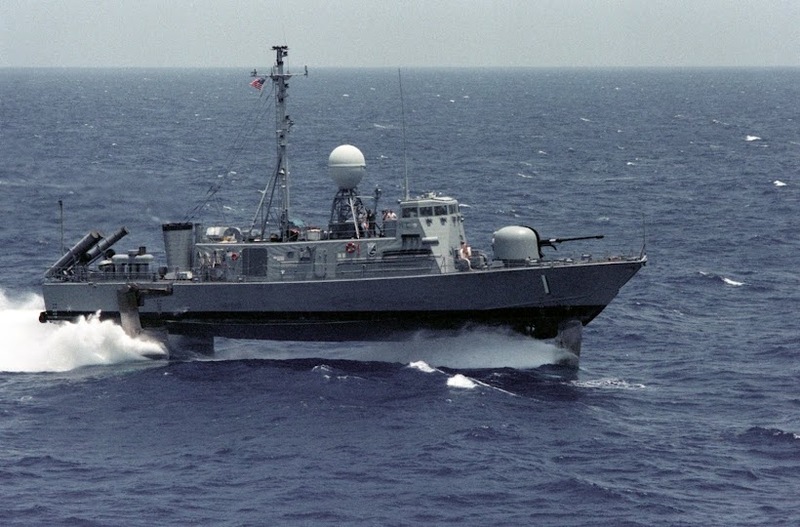 On March 18, the cruiser USS Cape St. George and the destroyer USS Gonzalez also had a shoot out with a suspected pirate boat off Somalia, where the ships killed and captured local pirates. The International Maritime Bureau, Pham says, calls the waters off Somalia "the most dangerous waters" in the world. Though Pham laments the lack of attention by the Bush administration and Washington experts to the Africa mission, clearly there is also somewhat of an internal power struggle going on between U.S. Central Command and U.S. Special Operations Command (SOCOM) over who will fight the "war against terrorism" in the region. 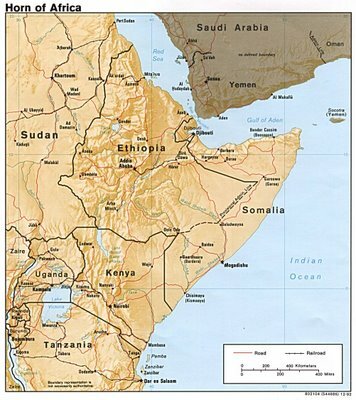 Though the United States set up a Combined Joint Task Force Horn of Africa in 2002 to operate against terrorist groups in Ethiopia, Eritrea, Sudan, Somalia, Kenya and Yemen, since then the Task Force has been pushed out of counter-terrorism tasks. 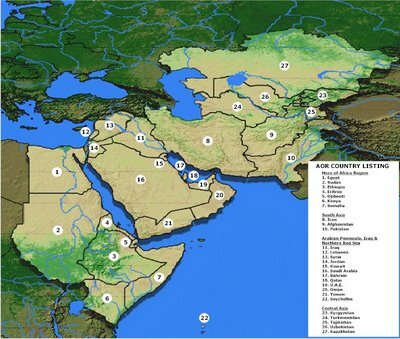 Map is of CentCom AOR. The Maritime Infrastructure Recovery Plan (MIRP) (PDF, 63 pages - 1.8 MB) is one of eight plans supporting the National Strategy for Maritime Security. It was developed in collaboration with public- and private-sector stakeholders, as directed by National Security Presidential Directive-41/Homeland Security Presidential Directive-13. Its development was also coordinated with other supporting plans, especially the Maritime Transportation System Security Recommendations and the Maritime Commerce Security Plan because of their importance to the secure flow of commerce. -The MIRP is intended to protect the American economy by facilitating the restoration of passenger and cargo flow, specifically container cargo, in the event of an attack or similarly disruptive event. Container cargo is more likely to hold perishable items in immediate need of unloading, or items that are key components in the production of consumer goods. 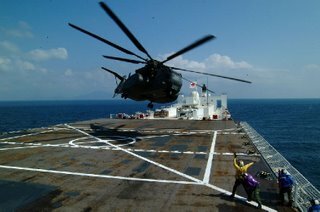 -The MIRP includes an exercise plan to maintain a level of preparedness within maritime community. This plan recommends periodic table-top and field exercises, which align with existing related plans such as the National Response Plan and the Top Official program. -The MIRP does not address long-term interruptions for conveyances that carry primarily non-perishable cargo. In addition, certain commodities, such as liquefied natural gas and oil offer very limited options for cargo diversion, as there are just four LNG ports, and oil refineries are already operating at 97 percent capacity. -The MIRP is not a plan for the physical recovery of a port that has been impacted by a natural or man-made incident. Rather, the MIRP protects the economy by providing guidance for redirecting container cargo traffic away from the impacted port to an appropriate alternate port. The Importance of Maritime Security. The importance of the maritime domain cannot be overestimated. Almost one-third of U.S. gross domestic product (GDP) is derived from trade, and most of America'’s overseas trade is transported by ship. According to the American Association of Port Authorities, $1.3 billion worth of U.S. goods moves in and out of U.S. ports every day. 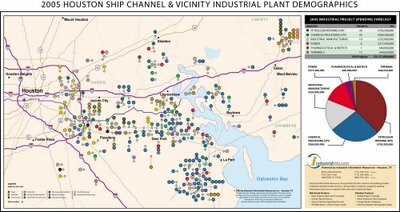 In addition, many major urban centers (more than half of the U.S. population) and significant critical infra structure are in proximity to U.S. ports or are accessible by waterways. Maritime security also has a critical defense dimension. 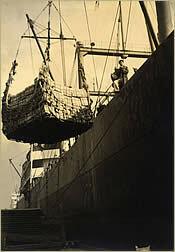 The vast majority of U.S. military forces and supplies sent overseas transit through U.S. ports. For example, in fiscal year (FY) 2003, the U.S. Military Traffic Management Command (now called the Strategic Distribution and Deployment Command) shipped more than 1.6 million tons of cargo in support of Operation Iraqi Freedom. America cannot be prosperous or safe without access to the sea. During the next 20 years, maritime commerce will likely become an even larger and more important component of the global economy. The main elements of this transformation will probably include continued growth in the seaborne shipment of energy products, further adoption of containerized shipping, and the continued rise of megaports as commercial hubs for transshipment and deliveries. Barring substantial and unanticipated reductions in the cost of air transport, this trend will persist for the next few decades. Over 10 million containers, which account for 90 percent of goods transported across the seas, entered the United States in 2005. 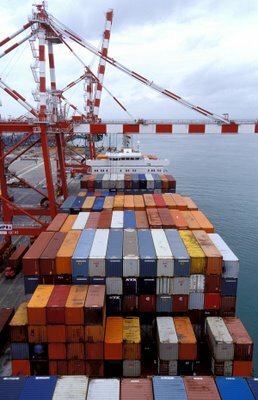 The number of containers entering the U.S. by sea could double by 2010. Seaborne transport will remain critical to defense as well. Despite the anticipated development of a new generation of long-range global strike aircraft and rapidly deployable future Army combat forces, it is highly unlikely that the U.S. military will be able to sustain a major campaign in the foreseeable future without the capacity to transport significant assets from the continental United States by ship. The nuke-in-a-box is an unlikely terrorist tactic. 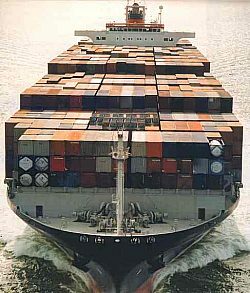 If an enemy wanted to smuggle a bomb into the United States, an oil or chemical tanker, roll-on/roll-off car carrier, grain or other bulk vessel, or even private watercraft would be a more logical and secure way to transport it, either directly to the target (e.g., a port) or indirectly by landing it in Mexico, Canada, or the Caribbean and then moving it across a remote section of the U.S. border. Indeed, logic suggests (and most experts believe) that a port is more likely to be attacked from land than from sea, especially given the lack of visibility into the domestic trade network, the lack of protection on the landward side, and the ease of constructing explosive devices with domestic resources. Terrorists are more likely to construct smaller items (e.g., biological agents) domestically and then to deliver them through FedEx. While nuclear smuggling is possible, so are dozens of other attack scenarios. Overinvesting in countering one tactic when terrorists could easily employ another is dangerously myopic. Spending billions of dollars and deploying thousands of personnel to search every container and harden every port is an extremely inefficient and expensive way to stop terrorists from using cargo containers, especially when they would probably use other means. There is no apparent viable business case for many of the proposed solutions for “hardening” shipping containers, conducting 100 percent physical container inspections, or requiring expensive tracking or monitoring devices. These measures would provide only minimal utility at the cost of billions of dollars in new duties, taxes, and operating costs. Such efforts would divert resources from solutions that would measurably strengthen mari time security, including watching the back door of American ports through which trucks, trains, and barges travel daily. As a matter of common sense, the United States should not attempt to make every cargo container and port into a miniature Fort Knox. Securing trade requires an approach that is more comprehensive and effective than just putting up fences and gates, posting guards at ports, deploying radiation detectors at every entry, and inspecting all cargo containers as they enter the country—approaches that would waste security resources by inspecting things that are unlikely security risks and create isolated, easily bypassed chokepoints to address specific (and unlikely) threats. The better answer to the nuke-in-a-box scenario as well as the much more credible threats is to increase U.S. efforts to interdict potential dangers before they reach the ports and use the best and broadest possible intelligence available, generated from a combination of commercial information and intelligence. In that regard, security measures should focus on building capabilities that will address a broad range of dangers rather than fixating on a few Tom Clancy–like scenarios. The first four of the new littoral combat ships will be based in San Diego, the Navy has announced. 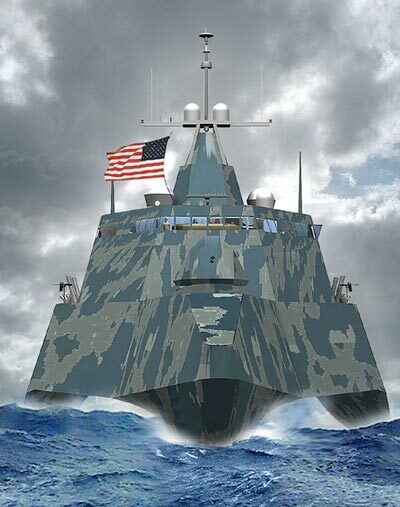 Littoral combat ships are designed to operate in the shallow and congested waters close to shore, an area called the ocean littorals. Slightly smaller than the current surface warships, the new ships are expected to travel much faster, be more maneuverable and be harder to detect by radar and other sensors. They also will be operated by a much smaller crew – 40 officers and enlisted personnel in the basic ship's crew, compared with more than 300 for destroyers and 200 for frigates. The littoral combat ships' unique feature is a platform for portable “mission modules.” These modules will enable the vessels to perform a variety of functions. Modules are being developed to counter sea mines, submarines and small attack boats and to conduct maritime interdiction missions, which are an increasingly important task in the fight against terrorists and piracy. 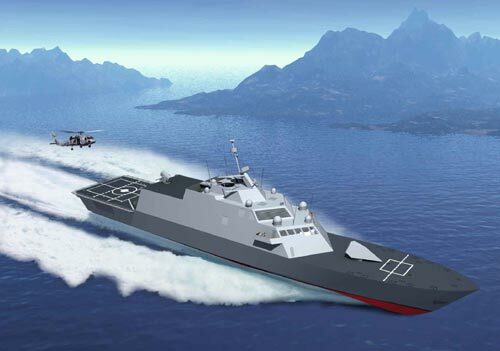 The Navy expects to buy 55 littoral combat ships. The agent of Al-Taji vessel that is being held by pirates in Gann coast 18 km north of Harardhere district of Mudug region in central Somalia asked for the release of the ship, which was chartered by Somali businessmen. As reliable sources told Somalinet. 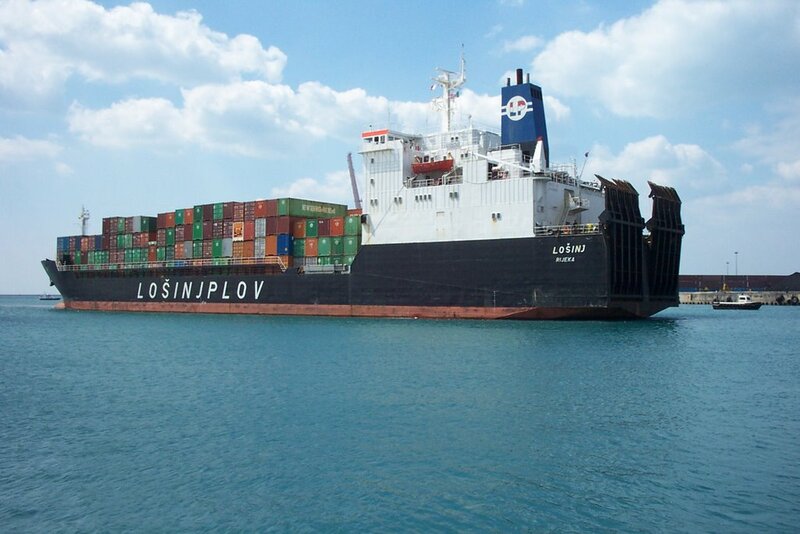 Isse Sheik Elmi who is in charge of the kidnapped ship said it sailed from Dubia port on 6 April and Elmaan seaport on 23 April where it unloaded goods by Mogadishu businessmen. "The vessel then sailed from Elmaan port on 25 April heading to port city of Kismayo, where it was due to unload goods owned by Kismayo businessmen" he said "we found pirates hijacked the ship near the coastal town of Barawe in lower Shabelle region of southern Somalia,"
The captain of ship from Libya and nine Indian crewmembers were on board the vessel, which was hired by Somali’s Kheyr shipping company. Sheik Elmi who is now in Mogadishu said there were ongoing talks between the pirates and the shipping company over the release of the vessel but no achievements were reached on the dialogue, urging Elmaan port officials to participate in the efforts of releasing the ship. 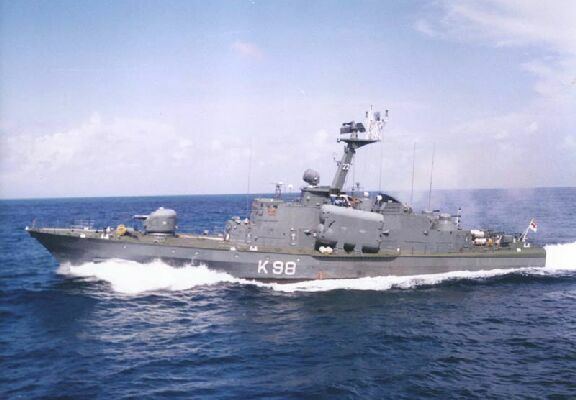 Alleged Somali pirates who engaged US Navy back in Somalia? Remember the shootout between a couple of US Navy ships and some suspected pirates a couple of weeks ago (if not, go here)? Somali men alleged with piracy who had recently been captured by US marines after they exchanged gunfire in the Somali water, have today been flown from Nairobi Kenya and brought back home by ICRC officials. The men whose faces are in the expression of pleasure to resume their freedom reported about how they were caught by US marines in Somali waters. Tahlil Hashi Elmi, one of US released men said they sailed from Harardere coast of Mudug region in central Somalia with two fishing boats and consisted of 13 fishers with automatic guns, which he said they were carrying it to defend against the enemy in the water. He said when they had gone into the sea deeply they found themselves surrounded by navy war-ships by US marines and fired towards them and they replayed with firing against the ships. In a phone interview on Monday, Cmdr. Robert Randall, the ship’s commanding officer, said the Gonzalez began tracking the suspicious three-boat tandem at 1:30 a.m. Saturday about 40 miles off the coast of Somalia. The three small boats fit patterns that American and allied crews look for in searching for pirates “almost to a 'T,’ ” Randall said. 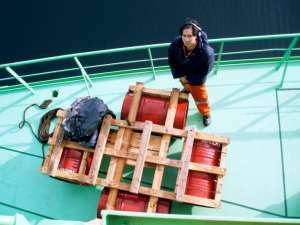 The Gonzalez, which killed its navigation lights to remain out of sight, followed the boats for three hours across 18 nautical miles in the darkness . Just before dawn, Randall ordered a pair of rubber inflatable boats, known as RIBs, manned with 18 sailors to board the suspected pirate vessels . Also see here. The US Navy seems adamant that the Somalis fired first. The Somali statements above are too poorly translated to figure out whether they are alleging that the Navy fired first, however, mistake or not, if the "fishermen" even raised a weapon for any purpose other than dropping it over th side of their boats, they placed themselves in a position of great danger. The 12 were then screened for possible criminal activity and terrorists links, the statement said. 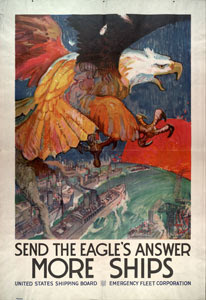 The U.S. government later decided repatriation would be the most effective and appropriate course of action. Cape St. George, a guided missile cruiser, and Gonzalez, a guided missile destroyer, were conducting maritime security operations in the area as part of Combined Task Force 150 when they spotted a suspect vessel towing two smaller skiffs bearing west toward the coast. The location and behavior of the skiffs were consistent with recent pirate activity in the area. As Gonzalez’s boarding teams prepared to conduct a routine boarding of the suspect vessels, the two Norfolk, Va.-based Navy ships noticed the group of suspected pirates were brandishing what appeared to be rocket-propelled grenade (RPG) launchers. The suspects opened fire on the boarding teams, which prompted a lethal response by U.S. forces. During the engagement, one Somali was killed and a fire ignited aboard the main suspect vessel. That vessel was destroyed by the ensuing fire. Boarding teams from Cape St. George and Gonzalez took the 12 Somalis involved in the incident into custody. The Navy boarding teams confiscated an RPG launcher, automatic weapons, and the two remaining skiffs. No U.S. Sailors were injured in the engagement. 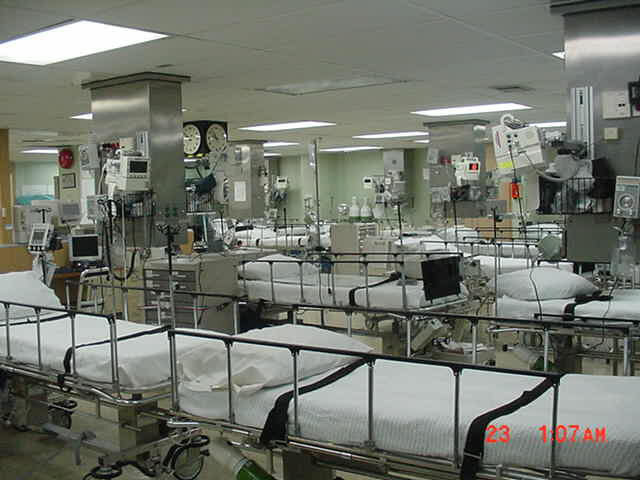 The Navy ships immediately provided medical treatment to the wounded suspects. Royal Netherlands Navy medical personnel, including a medical doctor, from HNLMS Amsterdam also assisted. al-Qaeda's number two Ayman al-Zawahiri has appeared in a video saying that Iraqi insurgents have "broken the back" of the US military. 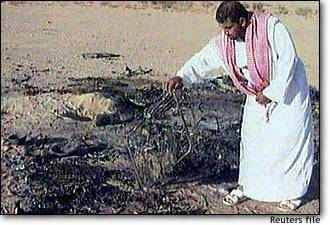 He praised "martyrdom operations" carried out by al-Qaeda in Iraq in the video, posted on an Islamist website. And he called on the people and army of Pakistan to fight against President Musharraf's administration. This is the third message from prominent al-Qaeda leaders to emerge within a week. You can keep saying it, Zawahiri , but saying it won't make it true. And if you weren't tryingto capture the misinformation war, you'd walk outside and see how well our military is functioning. Would you enjoy a Hellfire for breakfast, maybe? 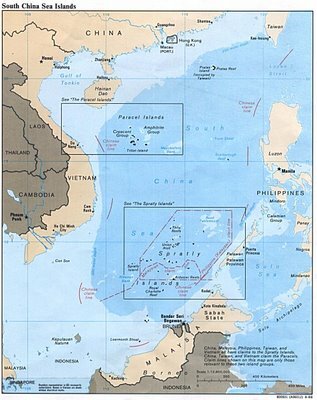 Major oil field off Vietnam: Wonder how you say "oil bidness" in Vietnamese? A drillstem test of a well on the Te Giac Trang (TGT) structure on Block 16-1 off southern Vietnam confirmed the discovery of what SOCO International PLC, London, calls "a major oil field." Logs indicated about 68 m of net pay in the LBH 5.2 sand and about 6 m of net pay in the Lower Oligocene C interval, which wasn't tested. SOCO said the TGT structure comprises five fault blocks extending over 15 km on a north-south trend within an 80 km long play fairway that extends along the eastern and southern porti on of Block 16-1. Nothing but the best neighborhoods for SOCO. China and a host of other oil-hungry nations will be tapping into huge offshore oil deposits a mere 50 miles from the United States while this nation is forced to endure rising gas prices as a result of record high demand for oil fueled by such countries as China and India. According to Sen. Larry Craig, R-Idaho, the U.S. energy sector has been "hamstrung" from seeking additional oil resources while at the same time allowing "the likes of China, Canada, Brazil, Spain, France and others to freely seek energy opportunities 50 miles off our coast without competition from state-of-the-art technologies and expertise of our own U.S. gas and oil industries." In a speech on the Senate floor, Craig said that a February 2005 U.S. Geological Survey report described "a possible deposit in the North Cuba Basin estimated at 4.6 billion barrels of oil, and possibly as much as 9.3 billion barrels." He then reminded his colleagues "that estimates for Alaska National Wildlife Refuge range from 4 billion to 10 billion barrels." 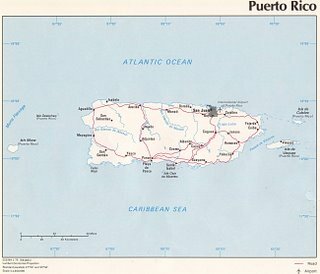 So, he said, "The question must be asked: 'What is the U.S. doing while foreign companies and countries are exploring right off the U.S. coast in the North Cuba Basin, which is adjacent to the U.S. 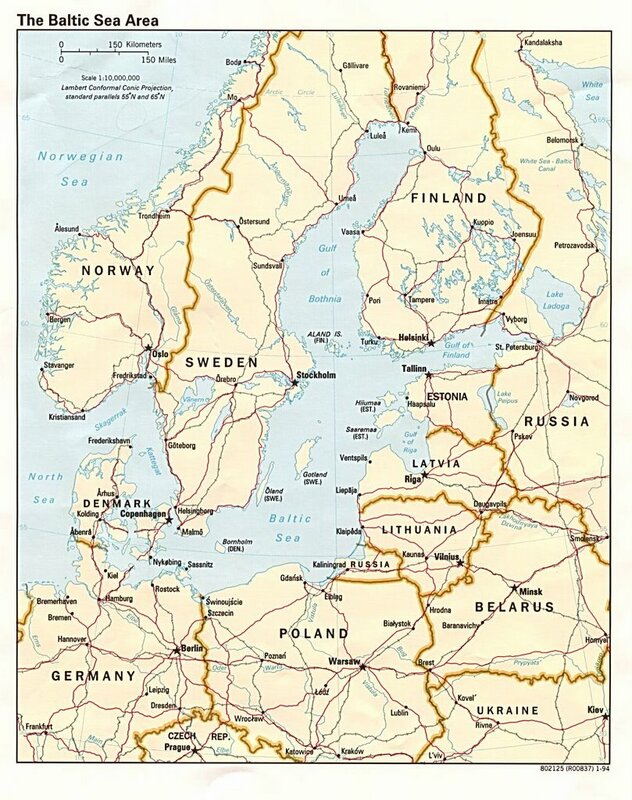 Outer Continental Shelf and contiguous with this country's Exclusive Economic Zone?' Well, I can firmly tell my colleagues that we are doing absolutely nothing. 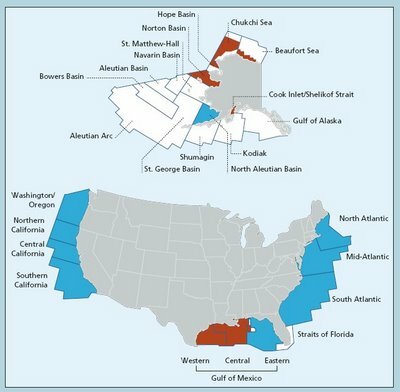 Not one single U.S. company is exploring in these potentially beneficial waters that extend to within 50 miles off the coast of Florida. So, we sit here watching China exploit a valuable resource within eyesight of the U.S. coast. I say -- not on my watch." Sometimes it is all about the OIL! Qatari Energy Minister Abdullah Bin Hamad Al Attiyah said the price of oil would drop by $15 should politicians end their expressions of concern over a halt in supplies. Al Attiyah said the record oil prices of more than $75 per barrel was the result of fears and speculation within the market. In other words, shut up. For a very brief look at ANWR, go here ( though I misidentified ANWR which stands for "Arctic National Wildlife Refuge"). For a lot more info, go here for the ANWR.org site. Added picture of "truss spar" offshore platform. 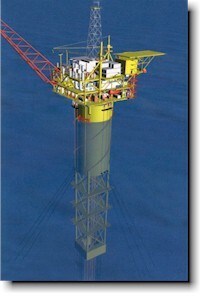 More info on "spar" offshore platforms here. Somali pirates hijack new vessel? [S]ources from the coastal town of Harardhere in north of Somalia say pirates kidnapped a new vessel from southern coast of Somalia and brought it to Gann coast of Harardere district. Sources close to the pirates confirmed Shabelle Media Network the hijacking of the vessel and it is yet known the number of the crew on board the ship and where it was registered. The boat was reported to have been heading to Kismayo port of southern Somalia when gunmen on boat attacked it and guiding towards Harardere coasts. Harardere coats of northern Somalia has been base for the Somali pirates where they still hold a ship registered from UEA and fishing boat from south Korea. A real short note here - expect a highly politicized attack on the Bush Administration starting at just after noon today. The State Department’s annual terrorism report will show that terror attacks have risen sharply. My G-d! That’s terrible! How could that have happened? Because Congressional legislation changed how we count. So the rise is not attributable to a rise in attacks, but that man[y] other types of violence are now included in the report. When you see the Democratic news conferences after noon today, expect that the rise in the number will be the primary talking point, with a follow-on that the Republicans are not stopping terrorism. Be prepared because it is coming. I am hoping for some typical words of wisdom from Rep. Nancy Pelosi, Dem, CA. She's put the "dumb" back into politics. TigerHawk has an interesting post defending the oil business (or we former Texan oil company hacks say, the "awl bidness") here. But after mulling the matter over, I've decided that Congress can do the least amount of harm to the nation if they take on a huge investigation of the oil companies. I suggest they start trying to figure out how royalties are to be paid to oil royalty owners, including the fantastic Minerals Management Service. From there they can look at the rise in competition in buying crude oil. Maybe they can figure out how to get more oil from what are now considered "depleted" oil fields. Perhaps they can all take a camping trip the area of ANWR set aside for oil exploration and report back on the wonderful scenic vistas they observed. Perhaps they will spend a few weeks on an offshore rig in the Gulf of Mexico. I further suggest they take a look at the environmental regulations they have passed over the years that have played a large role in making the building of new refineries more difficult and impacted the operation of the existing refineries. I suggest they look into the reasons why we are so dependent on oil, natural gas and coal instead of having developed a sound system of nuclear power plants. Perhaps they can explain the move to ethanol when there is a domestic shortage and a high tariff imposes against imported ethanol. Maybe they should look into how Brazil is getting so much more ethanol for its buck than we are. Maybe they can figure out how to get oil from oil shale without polluting ground water (and how water can get to the oil shale in the first place). Maybe they can do study on the transportation issues invloved in moving crude oil around the world, the cost of tankers, pipelines, and all the rest of it. And the cost of moving refined product (not just gasoline) to every corner of the country. How does asphalt get from Corpus Christi to Dead Level, North Dakota, anyway? Or -Senator Schumer - from Corpus Christi to New York - do you have a clue? That's enough to keep them busy for a couple of weeks. And keeping them busy means they won't be doing anything really stupid for a couple of weeks. Way to go, Mr. President. You are way ahead of those bozos in Congress. A SCHEME to protect Australia's ports from terrorists by screening all workers and issuing them with identity cards will not meet its deadline unless changes are made to the process. The peak ports body said yesterday planners for the Maritime Security Identification Card scheme had underestimated the time and complexity of the task. The federal Government said last August that the country's 130,000 maritime workers must apply for the card, as part of a tough counter-terrorism strategy. But The Australian has learned that only 1900 applications have been received - just 1.5 per cent of the nation's maritime workers. Some ports have not yet made arrangements to issue the cards for the scheme, which will begin next January. Today I am announcing yet another step in DHS plan to implement a comprehensive personnel screening program for port workers nationwide. What this will do is it will elevate security at our ports themselves so that we can be sure that those who enter our ports to do business come for legitimate reasons and not in order to do us harm. What this program will specifically require is that people working in the ports and those who get daily access to port facilities receive background screening and then a tamper-proof biometric credential that will strengthen our security at all of these facilities. We are going to begin to implement this program immediately. Today, the Coast Guard has exercised its legal authority to submit a notice requiring these background checks at our nation's ports. TSA will immediately begin conducting name-based background checks on all port workers operating at major U.S. ports. And to jump start this step, we've already been working and consulting with our industry partners to provide a process that will compare a worker's biographical information against our terrorist watch lists. Workers who we determine pose a security risk will be denied access to our nation's ports. Moreover, these checks will also include a review of a worker's immigration status, conducted by Immigration and Customs Enforcement and supported at TSA. Just like with other critical sectors of our economy, we will not tolerate the employment of illegal workers at our nation's ports or maritime critical infrastructure. This initial round of background checks, which is beginning with today's legal notice, will cover an estimated 400,000 port workers and will focus first on employees and longshoremen who have daily access to the security areas of port facilities. In other words, we're going to focus on those who could potentially be the greatest risk to our security. TSA anticipates this first layer of checks will be completed by the end of this July. The tanker grounded on its forward right side as it waited to enter a facility where it would transfer its shipment of oil, Castrodad said. Authorities were going to see if the vessel would refloat by itself at high tide later Thursday. More photos of MT Margara here, along with some additional information. 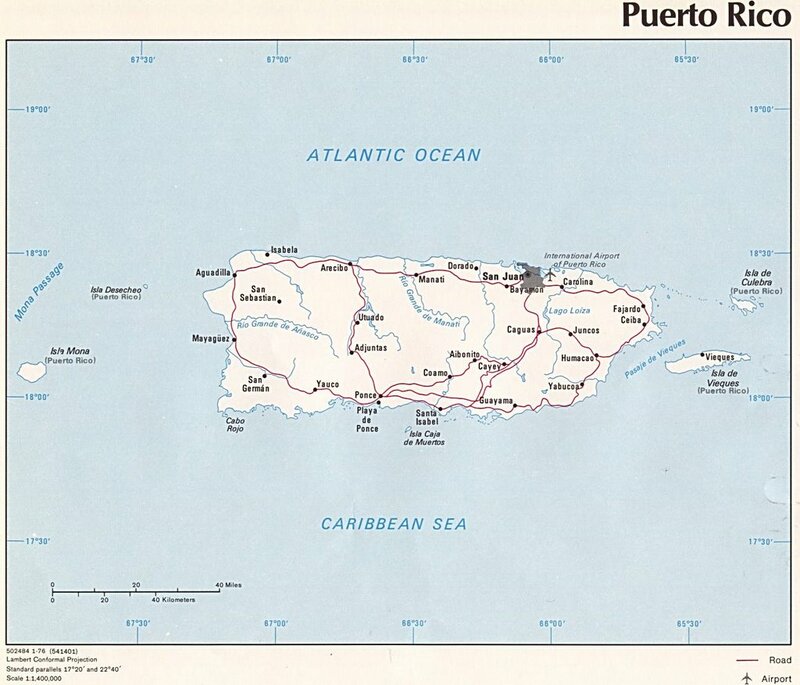 UPDATE: Tallaboa is just south of Ponce on the south coast of Puerto Rico. UPDATE: (4/28/06) High tide did not lift the vessel, which is being offloaded into barges as reported here. Vandals sprayed anti-war messages early Wednesday on ROTC buildings on the campuses of North Carolina State University and the University of North Carolina at Chapel Hill, authorities said. An Army ROTC building near Reynolds Coliseum at N.C. State bore the message "ROTC trains murderers" and asked people to resist "the racist war." The vandalism was reported to campus police at about 7:30 a.m.
"This is definitely not a racist war, and we don't see ourselves as murderers," said Maj. Jeffery Robertson, an ROTC leader at N.C. State who has served tours of duty in both Iraq and Afghanistan. "ROTC is not all about training warriors. There's a lot of civilian jobs that are done through the military that help this country run. 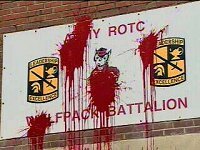 I think it's sad that people can write stuff like that and get away with it," sophomore ROTC member T.J. Duvall said. What a typical chicken poop act by a coward or group of cowards who lack the courage to engage in public debate. Who lack the intelligence to grasp the fact that ROTC students are all volunteers who serve so that others might be safe. Who lack the smarts to make up original slogans. Who are so cowardly that they attack unprotected buildings in the middle of the night. Over the decades, thousands of outstanding young men and women have passed through the doors of the ROTC buildings at Chapel Hill and in Raleigh. Men and women of character, courage and conviction. The slimeballs who marred the exterior of those buildings will never be able to lay claim to any of those honorable adjectives. And, yes, I have a personal stake. I graduated from the UNC Naval ROTC program in 1971 and my older son graduated from the UNC Naval ROTC unit in 2001. And we were just part of the long Carolina blue line. Hat tip to Black Five (from whence the UNC photos came thanks to Nora, a UNC alum and mother of a ROTC cadet- to see the photos of the UNC Amory larger, go to Black Five). Wednesday's incident was the second act of vandalism at the Naval Armory in recent weeks. On March 11 a stencil of a crossed-out bomb was painted on the stairs of the building. Damage was estimated at $100, according to police reports. The Naval Armory houses officer training programs for the Navy, Air Force and Army. There are roughly 130 cadets and midshipmen at UNC-CH, and about 25 enlisted and officer personnel work in the building. And could a couple of the comments at this site be considered gloating? or active encouragment? Uh, is this supposed to be a surprise? Headline: U.S. Oil Thirst a Growing Threat to National Security. Can an African force "solve" Somalia? While hosting an American delegation in Kampala 10 days ago, President Yoweri Museveni of Uganda expressed confidence that Somalia can be stabilised by African forces. The president was hosting a team led by Maj Gen Timothy F. Gormley, commander of the combined joint task force in the Horn of Africa. Museveni urged Western powers, the United States in particular, to support the Intergovernmental Authority on Development (IGAD) initiative on Somalia. The fighting in Mogadishu has been very intense. The Islamists call their warlord foes "demons" and the warlords label the Islamists "terrorists" linked to Al-Qaeda. While they are fighting for control of the city, neither of the two groups wanted the Transitional Federal Government (TFG), which was established in Kenya a year and a half ago, to rule the capital. Local media in Somalia recently reported that American officials have visited the headquarters of the European Union (EU) in Belgium to study the nature of the recently signed agreement between the EU and Somalia's TFG. "The US may attempt to block the most significant diplomatic breakthrough so far achieved by the TFG," remarked Ali Osman Moghow, a political activist in Baidoa. "We are confident that the EU will defend its support for the TFG, which stands for the best interests of the Somali people." In these circumstances, the Somali people are inclined to view President Museveni as an African statesman with a viable solution for the Somali problem. His call for military intervention, mobilisation of local forces, the International Criminal Court indicting those opposing the stabilisation of the TFG plus financial and diplomatic support, are right on the mark. "Museveni should continue his crusade, shedding more light on the US's dubious policy on Somalia," remarked Kassim Ali alias Shombe, a Mogadishu resident. "If IGAD, AU and EU are on the side of the TFG, Americans must be lured to support what is good for Somalia." What sends shivers down many peoples' spines is the TFG striving to stabilise the nation while the US pursues its own agenda to tackle pirates, recruit non-state mechanisms to confront suspected terrorists and cultivate a relationship with clan chiefs, sidelining President Abdullahi Yusuf. Where have all the pirates of Malacca Strait gone? 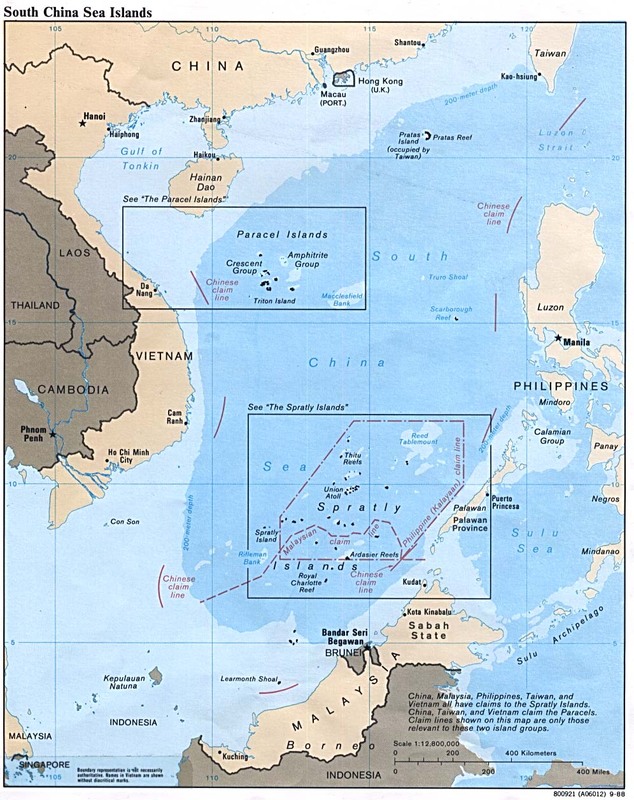 The three Southeast Asian nations launched coordinated air patrols in 2005. Singapore and Indonesia also have a ship surveillance monitoring center that tracks vessels in a sea lane leading into the straits _ which link Asia with Europe and the Middle East. Mohamad Anwar said Malaysia has planned separate bilateral exercises with both Singapore and Indonesia this year, and praised Jakarta for its efforts to bring down piracy levels. "They have made a lot of effort," said Mohamad Anwar. "What we are doing now is trying to get them (Indonesia) to commit more in terms of a presence of assets." Piracy watchdogs International Maritime Bureau said in its 2005 annual report that pirates struck a dozen times in the Malacca Strait in 2005, down from 38 the previous year. The London-headquartered organization singled out increased efforts from the Indonesian Navy for the drop. Singapore Armed Forces chief Lt. Gen. Ng Yat Chung acknowledged that the effort by the three countries along the waterway "has had an impact." 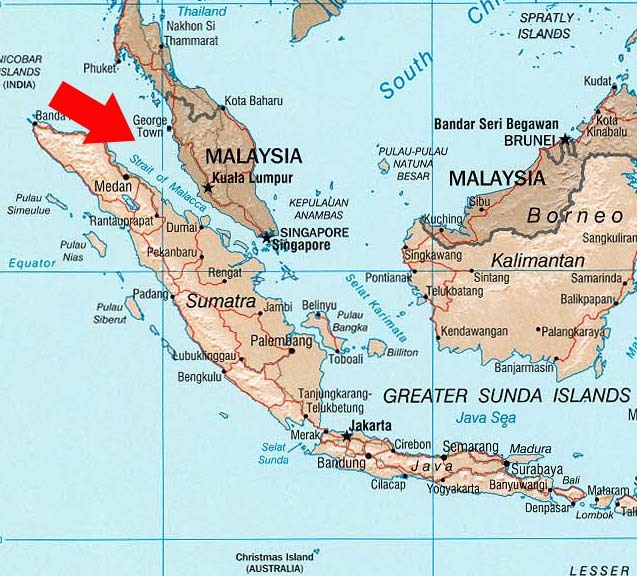 But note the warning for the southern end of the Malacca Strait, the "Gelasa Straits" (formerly known as Gaspar Strait). Malaysia criticized a leading international shipping insurer Wednesday for keeping the Malacca Strait labeled a war risk area - forcing vessels using the piracy-afflicted route to pay additional insurance charges. The Britain-based Joint War Committee of the Lloyd's Market Association has had the strait on its list of war risk areas since June 2005, despite the insistence of Malaysia, Indonesia and Singapore - which lie along the strait - that the waterway has become increasingly safe due to theircoordinated maritime patrols. "We are disappointed," Malaysian Deputy Prime Minister Najib Razak told reporters. "We don't think it is justifiable. It is certainly not backed by facts." Each year more than 50,000 ships, carrying half the world's oil and a third of its commerce, navigate the strait. Officials reported 12 pirate attacks in the strait in 2005, down from 38 the previous year. Security experts have also expressed fears that terrorists could target ships in the area. Confused? Wondering why up seems down or why you feel like you are living in Bizarro World?" Instapunk makes some sense of it all. 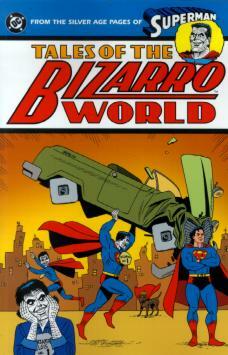 Of course, I'm old enough to remember Bizarro World. In the original comics. UPDATE: More on Bizarro here. 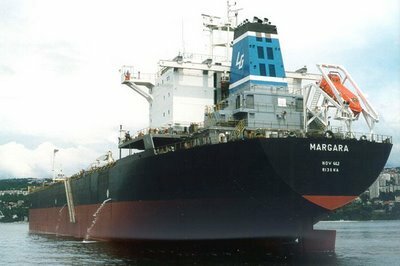 PANAMA is planning a $US5.25 billion ($A7 billion) expansion of its canal to handle a new generation of mammoth cargo ships and oil tankers. Built at a cost of 25,000 lives and opened in 1914, the Panama Canal was considered a masterpiece of engineering. While much of it is made up of roomy lakes, modern bulk ships are too wide and too long to fit in its narrow lock systems, meaning Panama needs to expand the canal or risk losing business. Mohammed Gadallah, who works at a hotel coffee shop near the bridge, said he initially thought a power cable had blown up. Afterward, he ran outside and carried a Russian boy to safety. Exactly. But they do have a creed: "Our way or no way." What will get your ship tossed out of port? The U.S. Coast Guard Captain of the Port expelled a vessel from Port Canaveral yesterday afternoon after Coast Guard marine inspectors found the vessel in violation of many serious safety standards. The Aral Wind is a 500-foot, gasoline tanker that was preparing to unload its cargo at the South Cargo Piers - Tanker Berth 1 when inspectors from Coast Guard Marine Safety Detachment Port Canaveral met the vessel to conduct a routine certificate of compliance boarding. The vessel did not have a valid certificate of compliance, and the conditions on the ship were so unsafe inspectors left the vessel shortly after beginning their inspection. Coast Guard inspectors found that high-level gas alarms in the vessel's cargo hold were disabled. These sensors warn the crew of the ship if the gas in the cargo hold is expanding above safe levels. As a result, large amounts of gasoline were leaking out of the ship's pressure release valve vent risers, which are designed to release gasoline vapors from the cargo tank. Marine inspectors also found the ship's explosive meters disabled. Explosive meters are designed to detect explosive and flammable vapors throughout the ship. 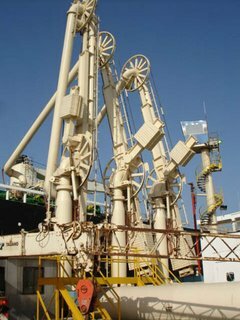 The Aral Wind's oil discharge monitoring system was also found disabled. The system monitors and records the amount of cargo discharged during an offload. The Aral Wind was issued a Captain of the Port order, directing the vessel to leave Port Canaveral just after noon yesterday. The vessel will not be allowed to return to the United States until it meets minimum safety and environmental standards. Coast Guard marine inspectors aboard the Aral Wind encountered levels of benzene exceeding those determined safe for Coast Guard personnel and in accordance with policy, disembarked the vessel. I wonder what port she sailed from? Hat tip: Holland & Knight's Maritime Developments. More info on what I think is the Aral Sea here. I note that Eastwind Ship Management PTE. LTD has made the US Coast Guard "Bad boy" list before. Photo from Ship Spotting.com, attributed to Ralph Dazert. And, yes, that's Istanbul in the background. Five incidents have been reported since 05.03.2006. Armed pirates are attacking ships around coordinates 02:55S -107:18E. Ships are advised to maintain vigilant anti-piracy watch when transiting the straits and surrounding waters. 23.4.2006 at 2020 UTC in position: 02:52.2S - 107:17.5E, Gelasa Straits, Indonesia. Seven persons in a speedboat approached a bulk carrier underway and attempted to board from stern. Alert crew mustered and activated fire hoses. Boarding was averted. Capt. Joseph L. Moore, a physician who is the mission's commander, said the goal "is to let people see America in a different light." The ship will stop in politically volatile nations where some factions are openly hostile to U.S. foreign policy in Iraq and elsewhere: the Philippines, Indonesia, East Timor, possibly Bangladesh and others. "Terrorism is like an infection. 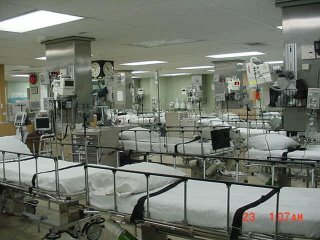 You need to eliminate the medium where it grows," said Rear Adm. Brian G. Brannman, commanding officer of Naval Medical Center San Diego. "We need to show the truth about America." 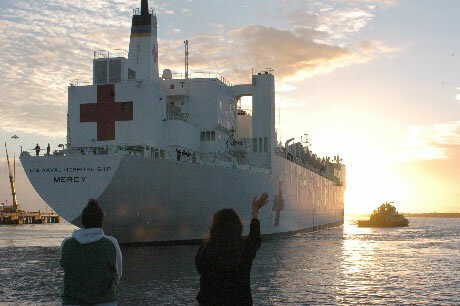 The new mission is a follow-up to the tsunami relief mission, which was considered a medical and political success. The ship will visit some of the same locations as the disaster relief mission, such as Banda Aceh, an Indonesian city on the island of Sumatra that was devastated by the tsunami. Some ports of call will be new, including the four provinces of the Autonomous Region in Muslim Mindanao in the Philippines, according to the government there. The region has long been a stronghold of violent groups that are dedicated to creating an independent Islamic state. Some of the groups have been linked to Al Qaeda and the kidnapping and murder of Westerners. As a noncombatant ship under Geneva Convention rules, the Mercy lacks the weapons of a warship. But Navy officials said they have taken unspecified steps to protect the ship and its personnel. 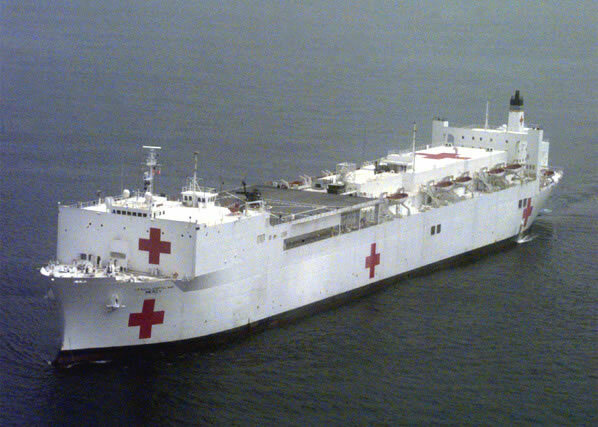 At 894 feet long, the converted supertanker has 12 operating rooms, four X-ray rooms, a dental surgery suite, a physical therapy and burn care center, a pharmacy, and about 1,000 medical beds. The ship can provide general and eye surgery, medical evaluation and treatment, public health training and even veterinary services. 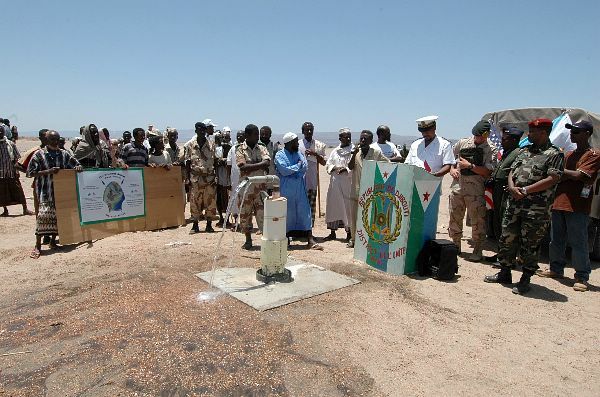 At each stop, host nations and nongovernmental relief agencies such as Project Hope will aid the U.S. effort. The command includes Djibouti - where the headquarters is - Ethiopia, Eritrea, Sudan, Somalia, Kenya and Yemen. 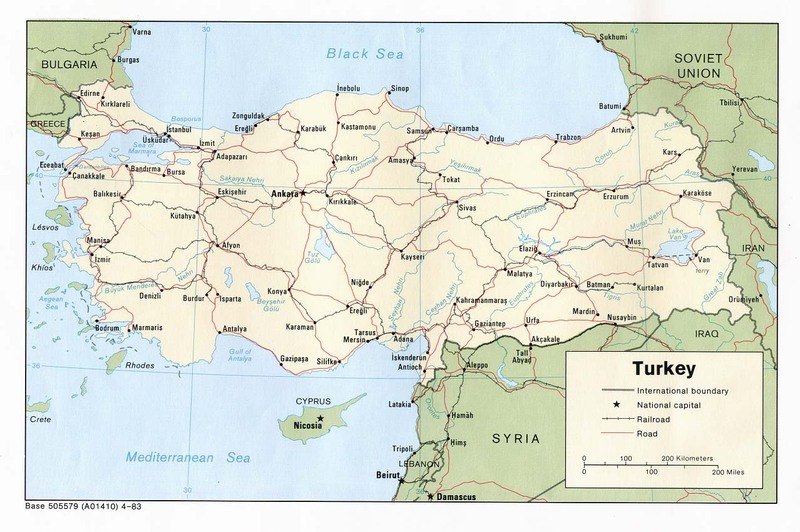 It is an area two-thirds the size of the continental United States with 181 million people. The command was originally conceived as one that would block terrorists from coming into the region once their safe havens in Afghanistan and Iraq were gone. "The mission morphed from direct action to doing theater security cooperation," Hunt said during a recent interview. This overall term includes civil military cooperation, humanitarian assistance, military-to-military training, and capacity building to improve regional security. On the military side, this embraces border security, maritime security, and training units to handle things at a national level. But this is a huge region facing a potential humanitarian disaster, and one four-man Army civil affairs team in Ethiopia handles an area the size of Connecticut. 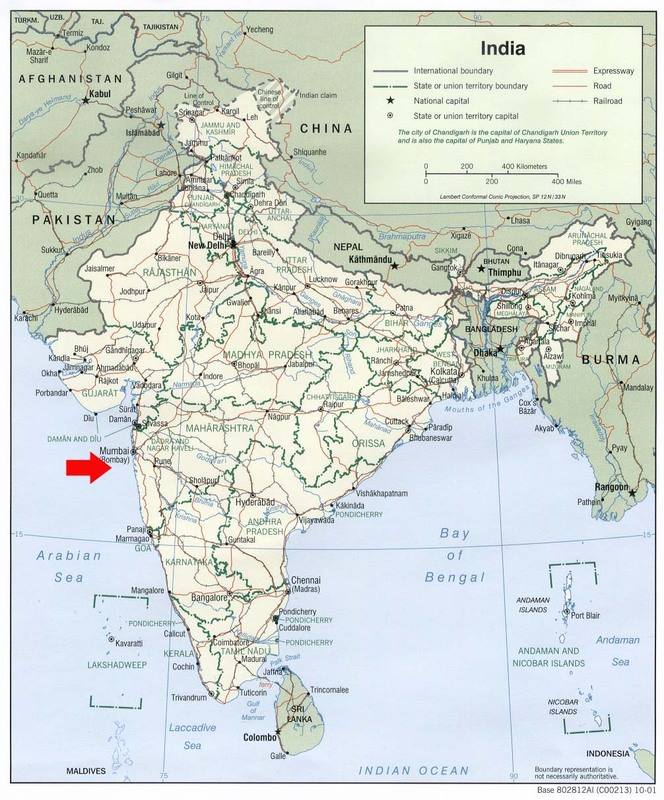 And the region has almost the same coastline as the U.S. eastern seaboard. The task force's area of operations has political challenges as well. When Eritrea and Ethiopia fought in the late 1990s, some 100,000 people were killed. The two countries are once again facing off against each other. "If that gets hot, I just get consumed doing things like doing (a noncombatant evacuation) and providing support in that area," Hunt said. The genocide in Darfur is in the region. The civil war in Sudan - while nominally over - still has pockets of fighting. Terrorists and homegrown "liberation fronts" also pock the area. And in the midst of this is Somalia - the largest ungoverned area in the world. Some warlords in Somalia have adapted a Taliban-style government, and others are flirting with al Qaeda and al Qaeda influenced groups. "We have human trafficking, smuggling of drugs and arms between Yemen and Somalia," Hunt said, "and in the south, the beginnings of extremist activity." "The size and complexity of the region is just unbelievable, and drought and disease make this puzzle even more difficult," he said. "But we have had successes, and we can capitalize on them." Facing all this complexity are about 1,500 combined joint task force members in Djibouti and another 500 "outside the wire" doing projects. Once conditions settle in Afghanistan and Iraq, Hunt said, he fully expects terrorists to try to escape to the Horn of Africa. "That requires us to be ready, to see these things coming and adjust resources accordingly," he said. The key is helping Africans to help Africa. "I went out with (representatives of the U.S. Agency for International Development) and visited a place where UNICEF is trying to save 'very distressed' children under 5 years old - they were trying to build them up with high-protein diets and try to monitor their condition," Hunt said. "That's an end-game kind of thing - a response to an emergency - and we spend lots of resources on that. What we want to do is get aid in early and help the people develop their capabilities so we don't have to have emergency relief to stop children from dying. "Food aid just teaches people to stand in line," he said. The joint task force has humanitarian teams in the region looking to build sustainable economies. They are working with the people to develop resources. And they are working with local, regional and national authorities to build the capabilities of the region. In the maritime domain, Hunt said, the command has a good working relationship with the U.S. 5th Fleet and Combined Task Force 150. Crime on the seas and piracy are problems that could be costing people in the region billions. "Every single official I speak with expresses concern about criminal activities on the sea and how it impacts them," he said. Nothing is more important, Hunt said, than recognizing that success in the region requires interagency cooperation. "We need to bring all elements of national power together," he said. Working with embassy teams, reaching back to U.S. Central Command in Tampa, Fla., and to federal agencies in Washington will help. The bottom line, though, is the area needs "sustained, long-term leadership from the interagency process," the admiral said. Pakistani Rear Adm. Shahid Iqbal relieved Royal Netherlands Navy Commodore Hank Ort as commander of Combined Task Force (CTF) 150 during a change of command ceremony aboard HNLMS De Zeven Provincien (F802) at the port of Mina Salman, Bahrain, April 24. The change of leadership marks the first time an officer of a regional nation has assumed command of any of the three coalition task forces that comprise the Combined Maritime Force. “I, my team, and the Pakistan navy feel elated and honored for being entrusted with this important, professional responsibility,” said Iqbal during his acceptance speech. “Terrorism is a worldwide phenomenon which has become an enormous challenge for the international community. Given the transcending nature of terrorism and its magnitude, it's not within the capacity of one single country or force to address this issue. 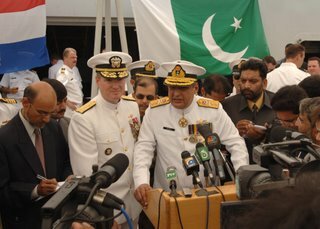 Vice Adm. Mohammad Haroon Hi, Pakistan navy's vice chief of naval staff, said the event marked an historic day for Pakistan and its navy. “Today we’re the most experienced navy in the region, and have the honor of being the only non-North Atlantic Treaty Organization (NATO) country to be entrusted with the responsibility of commanding a coalition comprising mostly of NATO countries,” he said. CTF 150, established near the beginning of Operation Enduring Freedom, is currently comprised of naval forces from France, Germany, Italy, Pakistan, the United Kingdom and the United States. The task force conducts maritime security operations (MSO) in the Gulf of Aden, Gulf of Oman, the Arabian Sea, Red Sea and the Indian Ocean. MSO sets the conditions for security and stability in the maritime environment as well as complement the counter-terrorism and security efforts of regional nations. These operations deny international terrorists use of the maritime environment as a venue for attack or to transport personnel, weapons or other material. Skipper of Cole suffers "Kimmelization"
From the start, Lippold was confronting a Navy tradition of punishing any ship commander who hazards his vessel. "Promotion is based upon a successful command tour," retired Adm. Harold Gehman, who investigated the role of Lippold's chain of command in the Cole attack, said in an interview. "They don't need any other reason than that not to promote you." Beyond that, an internal Navy report raised questions about Lippold's adherence to security procedures and the ship's training regimen. But Lippold's chain of command, up to the Joint Chiefs chairman and the secretary of defense, overruled the Navy report, finding that he could have done nothing to prevent the suicide bombing. A separate independent commission, led by Gehman and retired Gen. William Crouch, found that Lippold's superior officers had ill prepared him for docking in a place such as Yemen. "There were a lot of things that the people above him didn't do very well," Gehman said. More on "Kimmelization" here. And here. And, yes, CO's do bear the burden of always being right. Regardless of the circumstances- maybe- Admiral Nimitz did ground his ship and "was courts-martialed for grounding her, an obstacle in his career which he overcame." Hat tip: Cannoneer4 in his comment to an earlier post. Cargo Law reports here, that the Hyundai Fortune vessel is now offloaded (2,249 containers). Note: Cargo Law site is good, but very slow in loading due to both volume of traffic and the size of the photos posted. Be patient. Information at SvittzeerWijsmuller site here including link to picture of off-loaded ship being towed out of port to a more sheltered location...and more. Still waiting for final costs of fire to be gathered. This is a “state of Jihad address” by a Terror-leader who projects himself as the supreme leader of all Salafi Jihadists in the world. 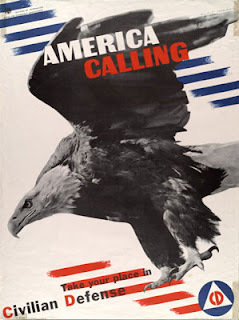 The document provide guidelines and vision to the followers across the continents: A call for mega-terrorism and a fiery delivery of a bloody war in all directions. 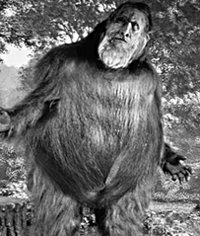 Not one single civilization and religion got away from Usama’s grapes of wrath: Muslim moderates, Shiites, Christian Catholics, Protestants and Orthodox; Jews, Hindus, Buddhists and Atheists as well. Europeans, Chinese, Indians, Semites, Africans and others were all deciphered as Kuffars, infidels. At least the U.S. now has lots of company. OBL should get more sleep. He's beginning to sound a little cranky. 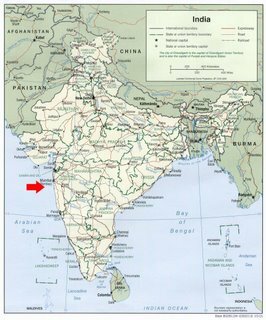 An Indian naval ship sank in the Arabian Sea off the western coastal state of Goa after colliding with a merchant carrier but there were no casualties, the navy announced on Sunday. “The 450-tonne naval patrol vessel sank after colliding with the Rajiv Gandhi container carrier belonging to the Shipping Corporation of India” on Friday, 35 kilometres off the coast, the navy said in a statement. “Following the collision, the naval ship sank just after midnight. The damage to MV Rajiv Gandhi has been minimal and she is presently anchored off Goa,” the statement said. “Seventy three crew members have been rescued. The rescued crew has been evacuated to Goa,” it said. INS Prahar is a Veer (Tarantul) class missile corvette. Just a notice: I'll be moving to a new email address soon. The new address will be posted in the old location in a few days. So I can finally kill my AOL account. They are simple steel boxes, 20 or 40 feet long and 81/2 feet high, with a pair of doors at one end and a wooden floor - truck trailers without wheels. Who would have thought such an ordinary creation would change the world? The cargo container has done just that, transforming the global economy in ways comparable to the telephone and the jet plane by making the world a little smaller. By dramatically increasing the efficiency of, and reducing the cost of, cargo transportation, the container has expanded markets for both U.S. and international goods. Now, it's commonplace to find Japanese televisions, Chinese clothing, Swedish furniture and German beer on American store shelves. The box altered the future of nations when manufacturing operations, chasing lower labor costs, sprouted throughout Asia, particularly in China. Malcom McLean, the owner of a North Carolina trucking company, launched the world on the path toward containerization and ultimately globalized the global economy. He didn't invent cargo boxes, but he did refit the first ship to carry containers . A variety of interchangeable metal cargo boxes had been tinkered with by various companies - mainly railroads - since at least the late 19th century, according to Levinson, a former editor at The Economist magazine. McLean overcame the financial and regulatory hurdles that caused others to stumble in their attempts to establish a useful container service. He was determined to make containers succeed, believing that growing highway congestion, plus road taxes and tolls, threatened the future of his successful trucking business, according to "The Box That Changed the World," written by Arthur Donovan and Joseph Bonney. McLean bought a shipping line and grew it into what became known as Sea-Land Service, which now exists as parts of the Danish shipping giant Maersk Line and the smaller U.S. carrier Horizon Lines. With containers, cargo could be packed once at the factory and unloaded once at the final destination. Along the way, that box might be carried by trucks, trains or ships. With the more efficient containers, labor costs plummeted because fewer workers were needed on the docks, on ships, in warehouses and on the railroads. Theft and damage also declined because the cargo was securely locked in the box. The cost of shipping goods worldwide now accounts for 1 percent or less of retail prices, according to "The Box That Changed the World." For example, it costs roughly 34 cents to ship a pair of shoes that sells for $45 in an American store from an Asian factory. And it costs about $12.50 to import a television that costs $2,500. UPDATE: Of course container allow for some interesting "cargo". The Navy needs them because it's creating a whole new generation of brown-water sailors. The Navy began rebuilding a riverine force late last year as part of a new, 40,000-troop command dedicated to sailors-on-the-ground combat and support. 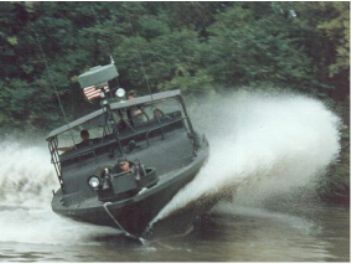 The riverine force comprises a small piece of the Navy Expeditionary Combat Command, about 900 sailors in three squadrons based at Little Creek Naval Amphibious Base. The force plans to deploy to Iraq next year, replacing a Marine unit on the Euphrates River. It initially will be just a sliver of the Vietnam-era brown-water fleet at its peak. But leaders in the new command quickly reached out to the old river veterans - scattered when the Navy dismantled their unit in the early 1970s. The Navy began calling in the brown-water sailors, from petty officers to admirals, last fall. Capt. Michael Jordan, commodore of Riverine Group One, said the veterans have offered valuable advice. The new sailors boarding small, fast boats in foreign waters have no combat experience to draw from. The veterans have been eager to help. UPDATE: PBR photo added from Warboats. 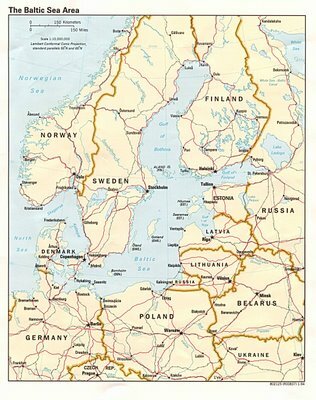 Swedish authorities Saturday were investigating how a man calling himself a "stateless American" ended up floating on a raft of oil barrels and wood planks in the waters between Denmark and Norway. The man — who carried no identification, spoke perfect English and said his name was George Williams — was found by a Norwegian oil tanker on Friday morning, floating in the Skagerak sea on a raft of four oil barrels held together by a frame of wooden planks. He told police he had been thrown from a ship several days earlier and now wanted to go to New York, but offered little further information. He asked to be taken in by Swedish authorities, and shielded his face from photographers when he was taken to a port in southern Sweden. "If he was thrown off a ship, they must have thrown off the raft for him to sit on as well, so I don't know," Swedish marine police spokesman Bengt Albinsson said. "We are trying to figure out the circumstances, but we will have to see how much he wants to tell us." The United States would soon provide Indonesia with an early warning system to support security maintenance in the Malacca Strait by three littoral neighboring countries Indonesia, Malaysia and Singapure, Indonesian military chief said. "The U.S. agreed to provide technical assistance needed by the three littoral countries in securing the Malacca Strait. Indonesia at the present time needs an early warning system," Antara news agency Saturday quoted Indonesian Military (TNI) Chief Air Marshal Djoko Suyanto as saying. The early warning system will be installed at several points along Indonesia`s territory on the waterway, as well as on maritime patrol aircraft (MPA), Suyanto said on a flight from Batam to Jakarta on Friday night. In addition, the U.S. also promised to exchange intelligence information with the three littoral countries on various matters relating to the situation and condition of the Malacca Strait, known as the world`s busiest waterway. Al-Basrah’s offshore oil terminal in Umm Qasr has increased its loading capacity due to the recent completion of repairs to six damaged loading arms on Platform B, Berths 3 and 4. Extensive repairs included total refurbishment of the hydraulic systems, vacuums and power lines. MilBlog Conference 2006 on line - go here and click on the live video/audio feed. Thanks to Greyhawk and Mrs. Greyhawk, Andi and the VFW (okay, my membership check is in the mail). 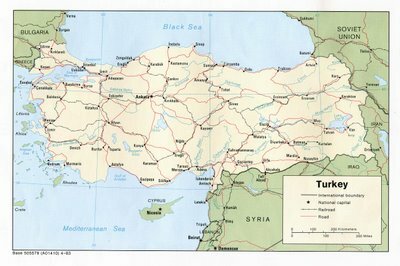 The U.S. system, which Turkey has taken as an example, aims to identify threats at sea, both underwater and above water. The system keeps track of all sea activities through various algorithms and reports them to a command center. The system can easily differentiate between swimming objects such as people and fish, and vessels that may pose a threat. Unmanned underwater vehicles and fixed sensors are used in the system. Greece has set up a similar system for its islands in the Aegean. Another similar system is being used in the Red Sea. A total of 13 radar systems, two vessel traffic-control centers and six automatic identification systems have been set up in Turkish straits as part of the Turkish Maritime Undersecretariat's agreement with U.S. corporation Lockheed Martin. The project was extended with an additional agreement signed in 2002 to include three more radars and two automatic identification systems that were set up in the Sea of Marmara. 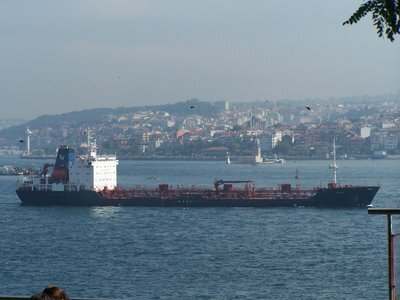 The Turkish system monitors vessels entering the Sea of Marmara through both straits and monitors shipping. A major part of the sea route through the Sea of Marmara is currently covered by the system. All vessels over 300 tons and passenger ships report their identity, speed and destination to the control center through radio links. This information is gathered at port command centers and maritime traffic is controlled by radar this way. The system enables both a regular flow of traffic and the inspection and identification of suspicious vessels. Washington ferries a terror target? The ranking was based largely on an analysis of significant suspicious incidents at maritime facilities around the country. "Our conclusion was that there was an extremely high likelihood, in a handful of incidents, that there was pre-operation planning" for a terrorist attack on the ferry system, said supervisory intelligence analyst Ted Turner of Seattle's FBI office. But Turner and other local FBI officials, along with the Coast Guard, suggested Thursday that the top ranking may be because of more aggressive reporting in this region. Ah, Google and Yahoo! They lead to such interesting sites. For example, some seeker of truth hit my site while searching for "how to speak dirty in Brazilian." Since I don't speak Brazilian or Portuguese, he or she probably didn't find much of interest. CHINA will levy a security charge on goods imported and exported through shipping ports starting on June 1 to cover part of the costs of new port security facilities, the Ministry of Communications said on its Website. Since the amendment of the International Convention for the Safety of Life at Sea and the International Ship and Port Facility Security Code went into effect on July 1, 2004, China has invested a substantial amount of money to improve port security. Those upgrades have increased operational and management costs at ports, the ministry said. The ministry said it has decided, in conjunction with the National Development and Reform Commission, to introduce the charge in order to continue on with the productive implementation of international treaties, and to learn more from the practices of foreign ports. The charge will be in effect for three years. Importers and exporters will be charged 20 yuan (US$2.50) for each 20-foot container, and 30 yuan for each 40-foot container. No charges will be levied on empty containers. ...the arrest of Yuriy Roshkalyov, captain of the motor vessel Leeds Castle for operating a commercial vessel under the influence of alcohol in violation of Title 46, United States Code, Section 2302. The statute, a Class A misdemeanor which is punishable with up to one (1) year imprisonment, prohibits the operation of a vessel while under the influence of alcohol. Roshkalyov was arrested and removed from the vessel on April 17, 2006. On April 16, 2006 at approximately 9:30 p.m., a New Orleans Baton Rouge Steamship Pilots Association (NOBRA) Pilot, made contact with the first mate who stated that the master, Yuriy Roshkalyov, of the M/V Leeds Castle, was not coming to the bridge because he was "not well." The NOBRA Pilot insisted on seeing Roshkalyov. The NOBRA Pilot smelled alcohol upon Roshkalyov entering the bridge. The NOBRA Pilot refused to sail based upon his suspicion of Roshkalyov being intoxicated. The NOBRA Pilot left the vessel due to his concern for his own safety. A Saint James Parish Sheriff's Deputy responded to the call for assistance and assisted the CGIS officer. A breathalyzer test was performed on Roshkalyov at approximately 3 a.m., on April 17, 2006. Roshkalyov tested .252 on the Alco-senor 4. In addition to the test results, the investigating officer observed an odor of alcohol; noted that the Master's attitude was combative; his eyes were bloodshot and his speech was confused. The federal statutory law provides that a person operating a commercial vessel on the waters of the United States is considered legally intoxicated if his blood alcohol concentration level exceeds .040. Roshkalyov , a Ukrainian national, is being held pending the outcome of the charges. Imagine: a big cargo ship runs aground trying to get through a narrow channel between Staten Island and New Jersey on its way to Port Elizabeth. It tears its hull and cannot make it to the shipyard for repairs because it is sitting low in the water and there is no other route to New Jersey. Such is the condition of New York Harbor--narrow channels, shallow waters, what were they thinking when they made this place a maritime center?--that such an event really happened, last Saturday morning. For a few hours, it blocked traffic. Then last night, the vessel made its way over to Red Hook's Pier 10, to the only container port in the New York area that did not require use of that channel. Where else could it have gone? American Stevedoring, the Red Hook port operator, and Rep. Jerrold Nadler, the port's chief cheerleader, staged a press conference today in front of the ship as it was unloading. It was a brilliant p.r. move meant to dramatize the possible consequences of Bloomberg's push to replace cargo ships with cruise ships in Brooklyn: What if a terrorist sunk a ship in Kill Van Kull and it refused to budge? Where would we get our food, our clothing, our bottled water? Nice snark about spell check, too. A freighter that got stuck in a shallow New Jersey shipping channel has been taken to the Red Hook port for unloading - a move critics say shows why the city shouldn't close Brooklyn's last working port. "The city depends for its safety and security on maintaining a port in Brooklyn," said Rep. Jerrold Nadler (D-Brooklyn), a longtime supporter of shipping in Brooklyn. The Port Authority won't renew the lease of American Stevedoring, which runs the Red Hook Container Terminal, when it expires next April. Nadler said yesterday the grounded freighter shows how vulnerable ships are in the Kill Van Kull, a narrow channel between New Jersey and Staten Island leading to the area's major ports. Nadler said a large-scale accident - or a terrorist attack - in the "treacherous, shallow" channel could cripple the region's economy. "In the event a large ship were to sink in the Kill Van Kull, most of our port would be closed for weeks or even months, and with it, New York City's import supply chain," Nadler said. He said waters off Brooklyn are about 100 to 150 feet deep, while off New Jersey they are only 35 feet deep, though officials are in the midst of a $2 billion project to deepen the New Jersey channel to 50 feet, he said. Port Authority spokesman Pasquale DiFulco called Nadler's argument "disingenuous at best." DiFulco said the Port Authority works closely with the Coast Guard on security at the Kill Van Kull. If something were to happen, the 90-acre Red Hook site is far too small to handle ships from New Jersey ports, he said. 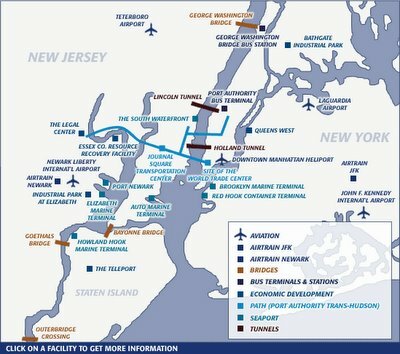 UPDATE; Added map of NY/NJ Port Authority sites from here. In the Houston area, where sprawling chemical facilities along the Ship Channel are intermingled with parks and private homes, plant security would seem to have special relevance. Houston's Chemical Market Associates, a consulting group, says the area has roughly 107 large-scale petrochemical plants and refineries. 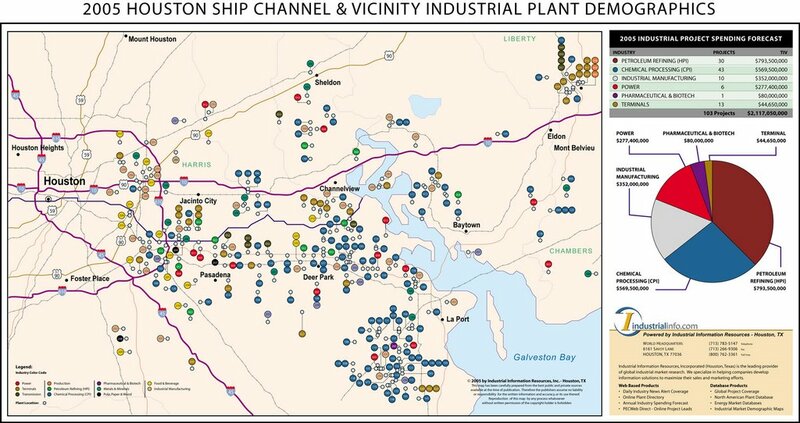 According to one congressional report, Texas is home to as many as 29 high-risk plants near population centers of 1 million or more — more than twice the number in any other state — and many are along the Ship Channel. "It is absolutely critical for petrochemical plants to be safe and secure," said Dennis Storemski, director of Houston's Office of Public Safety and Homeland Security. "Federal security standards for the industry would be another way to ensure adequate protection for the neighboring communities." Legislation currently in a Senate committee would rank the country's 15,000 chemical plants according to risk and would allow the Department of Homeland Security to penalize or even close facilities that do not meet government requirements. The bill places a premium on physical security measures — like guns, guards and gates — and has been accepted, for the most part, by the chemical industry and the department. Local firms Lyondell Chemical Co. and Dow Chemical Co. support most of the bill's provisions. Some Senate Democrats, however, maintain that the legislation is insufficient. Even Sen. Joseph Lieberman, D-Conn ., one of the bill's primary sponsors, plans to toughen the legislation by offering an amendment that would require chemical plants to use less-dangerous chemicals and procedures when possible, a practice known as "inherently safer technology," or IST. But attempts to require IST are opposed by the influential chemical lobby and the Department of Homeland Security. Chris VandenHeuvel, a spokesman for the American Chemistry Council, an industry group, said that many companies already employ safe technology measures. In late 2001, the council vehemently opposed a security bill that contained IST language. The legislation died on the floor of the Senate. "It is one of the most unclear concepts out there," VandenHeuvel said. "Nobody knows what it means. Nobody would know what it looks like. Nobody would know how to do it." Navy Times notes Pakistan to take turn at helm of Task Force 150. TF150 "patrols the waters off the Horn of Africa and within the Gulfs of Aden and Oman and the Arabian Sea, according to Cmdr. Jeff Breslau, public affairs officer for 5th Fleet/Naval Forces Central Command in Bahrain. Formed in December 2001 in response to the terrorist attacks on New York and the Pentagon, Task Force 150 rotates command among coalition member nations. The intent is to deny terrorists and other transnational threats use of the sea in that region." Pakistan is the first Muslim nation to head TF150 as noted here. 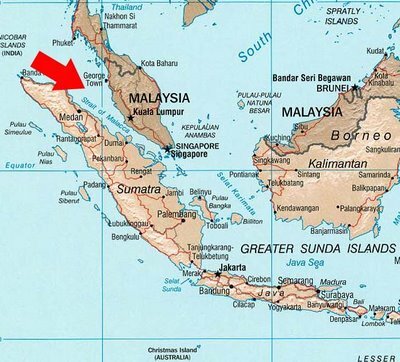 Singapore, Malaysia and Indonesia have signed a formal agreement to coordinate patrols along the Straits of Malacca. The signing is a significant milestone in securing the Malacca Strait, which is one of the busiest sea lanes in the world. The security of the Malacca Strait is seen as vital for the world economy. Each day shipping vessels carry more than 10 million barrels of crude oil through the Malacca Strait, and about 50,000 ships cruise that same sea lane each year. Naval ships from Singapore, Indonesia and Malaysia have been making their presence felt along the busy Malacca Strait since July 2004. Coordinated patrols were beefed up last year with the use of 'eye-in-the-sky' aerial surveillance along the busy sea lane. The chiefs of defence force from Singapore, Malaysia and Indonesia met in Batam on Friday to sign and formalise the Malacca Strait Coordinated Patrol network. The success of the coordinated patrols can be seen in the numbers -- two years ago when the patrols started, there were more than 30 reported cases of piracy along the Straits of Malacca, last year the number fell by more than two thirds. This year alone there have been only two reported cases. Under the agreement, there is better management and coordination of sea and air patrols. Operational units will also have their roles and conduct clearly defined, like the hot pursuit of bandits across territorial waters. THE region's continued fight against piracy took a big step forward yesterday with the unveiling of a network system that would allow the participating countries of the anti-piracy agreement to share information and monitor developments in the regional waters. Transport Minister Yeo Cheow Tong yesterday unveiled the Information Network (IFN) system which would form the backbone of the information-sharing arrangements. Developed by ST Electronics at a cost of close to $1 million, a prototype will be ready by June. The secure web-based system will facilitate 24-hour submissions of incident reports by ReCAAP member countries. Besides disseminating information and news alert to these countries, the system will also manage records through a database management system and generate textual and graphic reports for analysis. Most people don’t think of how vulnerable the agriculture community and agriculture is to terrorism,” Kassenborg said. The U.S. agriculture system is an attractive target for terrorism because livestock and crops can be infected with various diseases that can either harm animals alone or crops alone or both animals and people, Kassenborg said. Certain diseases do well in milk, Kassenborg said. Kassenborg said state and federal officials are working to reduce vulnerability in agriculture. RAND Commentary: "Securing America's Ports"
Ethiopia- Air hub for East Africa? Hyundai Fortune fire update: What was in the box? Pirates grab some hostages off the Philippines? al Qaeda and the pirates of Somalia? Iran's new "stealth missile" the Iskander E?